Wall calendar offers neat monthly planning for your office. 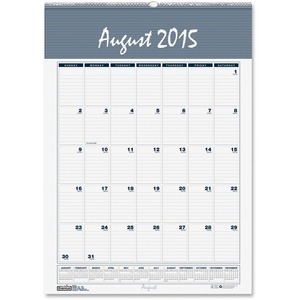 Planning pages range 12 months from August to July and are printed in wedgwood blue and gray. One-page-per-month format includes ruled daily blocks (1-1/2 x 2-1/4"), count of days/days remaining, national and religious holidays, and full-year reference calendar. Wall calendar features a full chipboard backer and is wirebound with an eyelet for easy hanging.